3 Feedbacks on "Flintlock Lantern Pistol"
Hm, this thingummy looks suspicious to me. Very suspicious. Circa 1800 ? Certainly not. At least because the lamp is not that old. 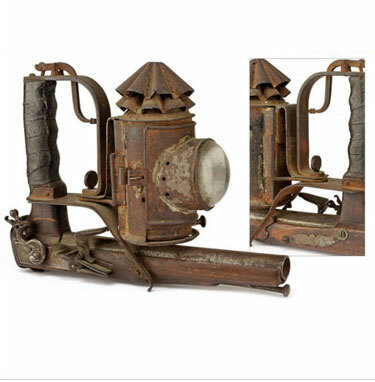 Made during the second half of the XIXth century in the best of cases, from the wreckage of a late XVIIIth century pistol, and a lamp from the second half of the XIXth. But I wouldn’t be surprised, when looking to the real thing, to discover that this botch-up was made during the XXth by some folk who did it for fun. I wouldn’t pay even a single buck for it anyways. I looked at the pictures of this thing more carefully on the website that publishes some enlarged pictures of it. My conclusion is that the pistol has probably been crafted in a shop of a third world country during the second half of the XXth century. It doesn’t come from an occidental country, anyways. Parts are poorly done and I strongly suspect that they even cannot properly work and shoot a bullet; some of them seem to be crafted from modern manufactured pieces of mere iron. The hand has been carved for a better grip for the shooter’s fingers, and covered with a rolled tape of old leather; which are the marks of an inspiration from modern guns and parts made during the second half of the XXth century. Even the rust looks artificial. Well, it’s either a complete fake, or a steam-punk gun for a movie, or, again, something someone has done in a basement as a way to kill time or for fun. That’s all. This was discussed on a firearms collector’s page…. I and another fellow who worked int the movie industry believe it is a movie prop…. the lock comes from a repro Scottish all metal pistol….. the rest cobbled together from bits and pieces… the lantern dates from the 1850’s or later well past the flint lock era…… fantasy piece… or like has been commented it would work well for steam punk….